Update: My mother is “almost” fully recovered. She does get tired in the afternoon and has a few lingering antibiotic needs. Also, she is starting to act like a 50 years old lady and not the 30 years young lady she did before she got sick. Although she is more than 60 and less than 80 (you’re welcome mom), she still refuses to act her age and that makes all of us happy. She will be visiting Los Angeles in the fall and if you see a couple of (should I say “elderly”) woman running through the fountains in some public place, you will know that at least one of them is my mom. “Where’s Truman?” I suddenly wondered as the disappearance of my four-legged shadow dawned on me through the black hole of stillness his absence had created around me. Like coming out of a deep sleep to realize you aren’t in your own bed, I quickly ran through the possible causes and ramifications of the moment. Although not a sign for immediate panic, in the early days with Andrew, silence was rarely a good thing. Add a year old Labrador puppy into the equation and silence usually meant trouble. Andrew had gone into the backyard and was playing with Katherine from down stairs. A tomboy at heart, she had found a ready and willing fencing partner in Andrew and they were knocking each other about with Nerf swords. They had not seen Truman and I started to move quicker. Checking every corner of the house and calling his name, I was about to run outside when I heard a muffled canine yelp coming from Andrew’s room. I looked into the room and all I saw was a sea of Lego across the carpet. No Truman. Then the armoire started to bark. I found my tail wagger scared and waiting like a fairy tale slave to be saved from the tower. Fright, relief, anger, then concern: the constant sequence of emotions that had become my daily life since I had become Andrew’s father. I called Andrew in and went through the dance steps that were quickly becoming second nature. Lecture, consequences, lecture, consequences. With most things, he learned quickly, but with animals it was a never-ending battle. I was sure I would eventually win, but friends and family suspected a Vietnam quagmire or worse. The problem was that Andrew treated all animals very badly. They were squeezed, pulled, smothered, and even a Michael Jackson moment of terror for my parent’s little mop of a canine when Andrew dangled him over the guardrail of their balcony. I know friends and family read into each act some sort of opening scene to Silence of the Lambs III, but I immediately recognized the profound need he had to connect with the very animals he tortured. Each horrible interaction with furry friends was really his inept attempt to get them to stay by him and hopefully love him. It didn’t help that our own dog had deeply bonded with me before Andrew came onto the scene and had to be coerced with mega-treats to go near his bedroom. Of course, I counseled Andrew on how to work kindly with animals and I really tried to instill in him the “leave them alone and they will come to you on their own” approach that is a key life lesson all on its own. But that takes patience. And when your desire to be loved needs immediate gratification from a cuddle or hug, it is the hardest lesson to learn. I clearly saw the ramifications for his love life later down the road and wanted to help him get a handle on this before he mistook a barrage of unwanted attention as being the best way to “get the girl.” These were abandonment issues 101 and if he were ever to have healthy relationships this was the place to start. It was the Michael Jackson balcony scene that was the turning point for the animal issue. The consequence was that he was not allowed to touch, pet, or even look at Truman for a week. This was torture for Andrew and worked precisely because it was affection he was looking for and not a darker purpose of animal cruelty others worried about. Slowly he got access back to the Truman, but with even a little mishap would go back to détente where each party would be kept in neutral zones. Sure enough, his interactions grew gentler and within a short time he could be trusted (as well as most 9 or 10 year olds) with animals. Truman would remain weary of him for a few more years and even though he remains “my dog” to this day, he now has clear affection for and loyalty to Andrew. We have even worked out an arrangement where Truman sleeps with me one night and Andrew the next. Both of us hate our nights alone. So when I got “the call” a month or so back, it seemed like the right thing to do. “The call” was from a long time neighbor, Donna, who wept as she told me that her brother had just passed away and was survived by three dogs and three cats. Her brother was a trucker who lived in Salt Lake City and had been collecting strays for some time. The burden of finding them all homes had been passed to Donna who was also frantic with funeral arrangements and closing up her brother’s home and affairs. She had heard from our downstairs flat mates that I was interested in Red Heelers. Her brother’s favorite was a Red Heeler named Teddy. She couldn’t imagine a better home and wondered if I would adopt him. My sister has Heelers and, yes, I do like them. More importantly, I gleaned from a conversation a silent nod from my neighbor’s below, that a second dog would not break our friendship of 25 years. I had been dreaming about a second dog for a while, but had held off for their sake. Perhaps they thought it was a better alternative than the chickens I’ve been dreaming of for even longer, but that’s fodder for another post. Between the green light here at home and the news of her brother’s death following on the heals of my mother’s near death this summer, I told her that I would take him. Actually, I had been experiencing a reoccurring nightmare the last six months where I was searching for a red dog that needed to be found. We both agreed that this could be the little dog that I was searching for. Andrew was very excited about the news. He had badly wanted a dog to call his own; one that would want to sleep in his bed without coercion. A week later, on a Sunday morning at 6:30 am, Donna and Teddy pulled up to the house. Teddy greeted me like he had known me for years. Donna and I sat on the front lawn and talked as she threw the ball for him. Just like my sister’s Heelers, he didn’t need a leash to stay at your side or near by. He made sure that he kept us properly herded right there on the lawn. Truman seemed to like him too and when Andrew met him, he fell in love. Everything seemed to have happened for a reason and with just a few tears Donna was ready to leave. Part 2 and 3 to follow soon! It’s September 1st and suddenly my morning commute had the slight chill in the air that I have come to recognize as Los Angeles Fall weather. For those who live outside of our Sunset magazine growing area, 62 degrees at 7:00 am will not sound at all Fallish, but for us, it’s almost sweater weather. Yet, by mid-morning I’m out in our school garden eyeing the tomatoes yet to ripen and feeling a twinge of sadness that they and our summer will soon be gone. When it comes to the end of the tomato season, I feel like Dorothy saying goodbye to the scarecrow with her tearful “I think I will miss you most of all.” Yet, if you still have an abundance of tomatoes on the vine or access to a good farmers market there is still time to enjoy the fruits of summer. I can’t think of any better to relish all the garden has to offer or to show off the beauty of the tomato than with Gazpacho, the famous Spanish cold tomato soup that epitomizes summer. I make this by the bucket full and always have some in the fridge right up until the last tomatoes give up the fight to fall. Most will think of this as a chunky, almost salsa, like soup, but the best Gazpacho is made with a high-powered blender and strained until a silky and luxurious consistency. However, when it’s just me eating it, I often forgo the extra step of straining to get every last bit of fiber and nutrition. Also, most recipes call for serving it with garnishes of chopped veggies, but I usually just pull it out of the fridge and pour it into a glass and drink it like a V8. That’s how most Spaniards do it and how I learned to enjoy it while living in Spain. 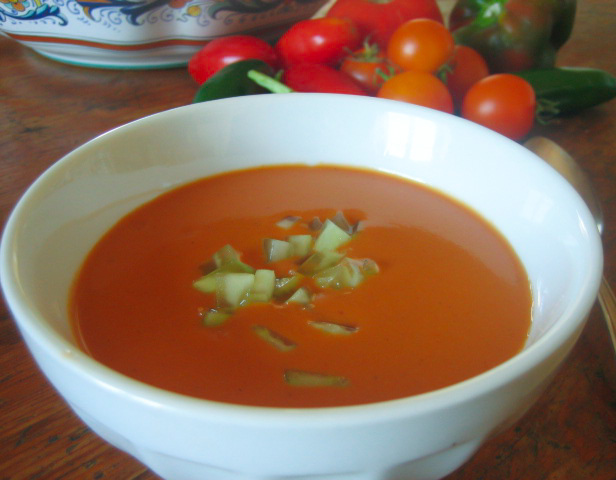 There are as many recipes for Gazpacho as there are varieties of tomatoes at eh farmer’s market, but they are all mostly a variation on a theme. Play with this and you will find the right mix for you. This recipe calls for 4 to 6 large tomatoes, but I almost always use more than less. Start with 4 and if you feel the soups other ingredients overpower the tomatoes, then keep adding until you get the flavor you like. 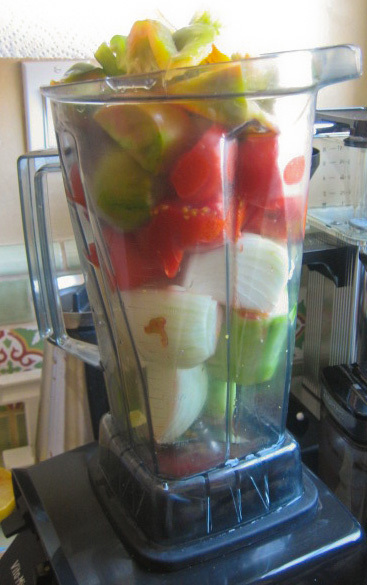 Also, if you don’t have a Vitamix or large blender, you may have to do this in batches. Combine all ingredients in a bowl and let sit for a bit to soften. Put in blender (in batches if needed) and blend until smooth. Strain (see note) and chill several hours to marry flavors. Serve in chilled soup bowls and garnish with toppings in separate bowls or do as I do and just drink it for a cold summer lunch or snack. Note: I use a Vitamix blender and run it on high for a couple of minutes. Then I often strain the Gazpacho through a fine sieve. This creates a very smooth texture that is pleasing on a hot afternoon. Place each of the above ingredients in a separate bowl. please please please write another soon!!! the gaspatcho(?) looks really good!